Fatigue Project kicks it up a notch. We can expect a live link to the survey tool next month. The results of this formal survey will inform the research design for a prospective clinical trial of therapeutic interventions to combat MPN-Related Fatigue (MRF). If you were part of the first MRF Cohort you will be automatically notified once the on-line survey link is available. MRF is the most common and likely the most debilitating symptom of myeloproliferative neoplasm. To participate in this vitally important research, you can sign up simply by sending an e-mail to MRFproject@gmail.com and type FATIGUE in the subject space. The big bi-annual MPN patient educational event run by Weill-Cornell-based Cancer Research & Technology (CR&T) is best known as the forum for MPN’s Dr. Richard Silver. The one day meeting, organized by the CR&T team — including Silver, Dave Boule, patient committee chair and Mike Wargo, vice president — brings together leading investigators to present state of the art findings in research and clinical practice to MPN patients. 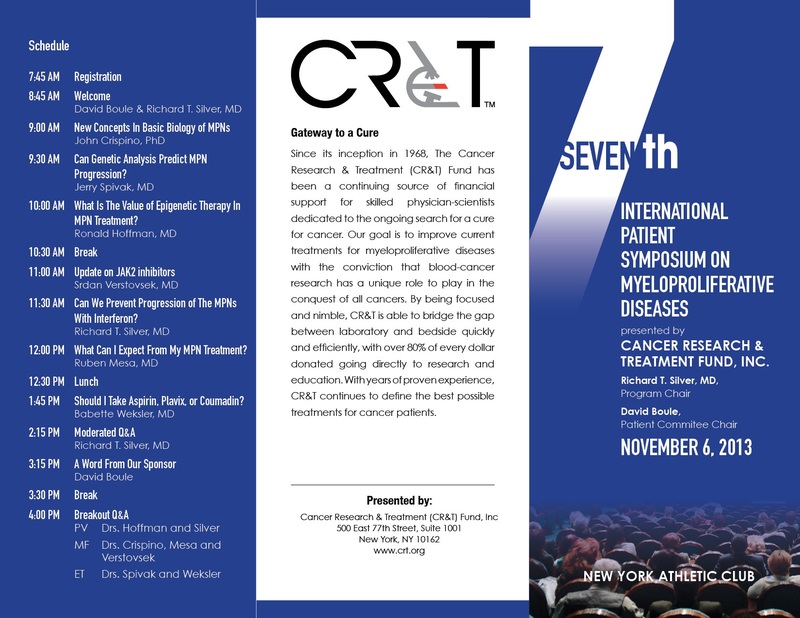 Two years ago CR&T broke new ground by introducing the patient-driven symposium. (See the MPNforum story here.) A patient committee drew up the agenda that included direct questioning of speakers after presentation in plenary session and break-out sessions by disease type for small group discussion. This year, eight patients including administrators of local MPN Support groups, contributed to the content and format. According to Dave Boule, ” We got some surprises…some topics we thought were “no-brainers” were voted down and other new ones came up.” The lineup for the November 6 event includes Dr. John Crispino leading off with an overview of Basic Concepts in MPN Biology. Dr. Jerry Spivak will talk on the ability of Genetic Analysis to Predict MPN Progression.” And on the subject of progression, Dr. Silver will talk about the evidence for Prevention of MPN Progression with Interferon. On hand are Dr. Srdan Verstovsek ( “Update on JAK2 inhibitors”), Dr. Ruben Mesa ( “What Can I Expect from MPN Treatment? ” ) and and Dr. Babette Weksler (“Aspirin, Plavix or Coumadin?”) Dr. Ron Hoffman will talk on the Value of Epigenetic Therapy. For program details and registration form, click here. You might want to call first. At press time the event was nearly sold out. You may have gotten this e-mail from the Leukemia and Lymphoma Society. It opens a new front in the on-going battle of blood cancer patients and caregivers to secure fair, cost-effective, affordable pricing of life sustaining drugs. The quote below is from LLS. The petition can be signed here. After the LLS appeal, below, you can get more background on the Patients’ Access to Treatments Act of 2013, on the provided links. “The lives of many blood cancer patients are threatened by “specialty tiers” drug pricing – a discriminatory practice that puts essential anti-cancer medications out of reach for far too many. This Blood Cancer Awareness Month, we need your help to convince four key members of the House Committee on Energy & Commerce’s Health Subcommittee to support this crucial legislation to aid people who are in the fight for their lives. Silver finds WHO PV criteria requires significant revision. 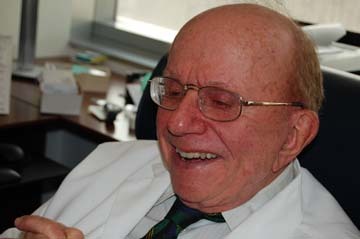 Because it’s clinically important at early stages of MPN development to distinguish polycythemia vera from essential thrombocythemia — and these two flavors of MPN can be deceptively similar in the beginning — Dr. Richard Silver and his Weill-Cornell team undertook a prospective study of a patient group. While not all 30 patients met the major and and/or minor criteria for a PV diagnosis determined by the World Health Organization, 28 of 30 patients showed high red cell mass. High RCM was taken as a determining PV factor when considered with bone marrow morphology. These patients went on to require phlebotomy to maintain safe hematocrit levels. The two other patients with normal RCM levels were diagnosed with primary MF and ET respectively. The MF patient died four years after diagnosis, the ET patient remained stable. A full review of Silver’s paper published in Blood (September 12, 2013, Vo. 122., No.11) will appear in the next MPN Quarterly Journal in October. Last month we reported on a new MD Anderson newsletter publishing project . We had a firm grip on the tail while the dog was wagging away. The real story is the foundation of the new Clinical Research Center for Myeloproliferative Neoplasia within the Department of Leukemia at MD Anderson under the direction of Dr. Srdan Verstovsek. As the largest center in the world for MPN patient referral and research, with over 250 new MPN patients seen annually, MD Anderson’s decision to establish an operational unit devoted to translational research leading to effective treatment strategies is good news for MPN patients and caregivers. Good news…but there’s not much for us to do about it, whereas the newsletter could use our help. 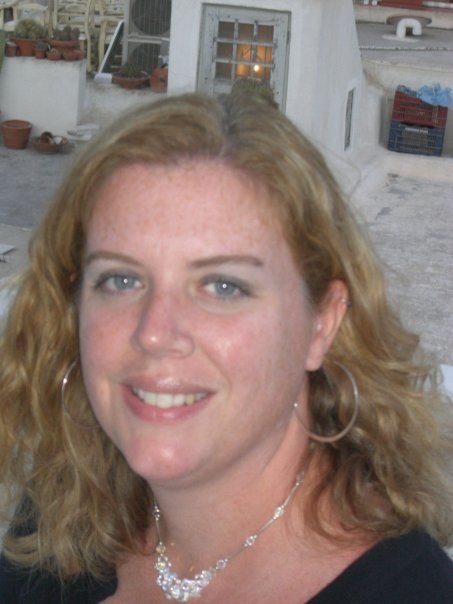 Kate Newberry, PhD, a biochemist/science writer is handling the editorial chores for the newsletter, one of the Center’s planned publications. She needs a couple of things: A name, for openers, some content, and a friendly welcome from the MPN community. And then there’s the issue of content. It might seem a bit ambitious but Kate has hopes for launch date in Saturday November 23 to coincide with the Patient Power Free Seminar to be given in association with MD Anderson. Got a good doc?…Share the wealth. The List of Hematologists, MPNforum’s most popular destination, registered its 9,000th visitor this past month. The List is a compendium of patient-recommended hematologists and is organized geographically. For the most vital partnership we need as we face the on-going monitoring and treatment of our MPNs, finding a trusted, competent hematologist experienced in MPNs ranks as our primary responsibility. It’s not an easy task. If you succeeded, consider sharing your find with your blood brothers and sisters. To add your hematologists to the List just go here. You can make yourself available to talk with others looking for a hematologist or simply fill out the form.